Creation: Appeared in July 1933 (CTB) as a renumbering of VA 516. 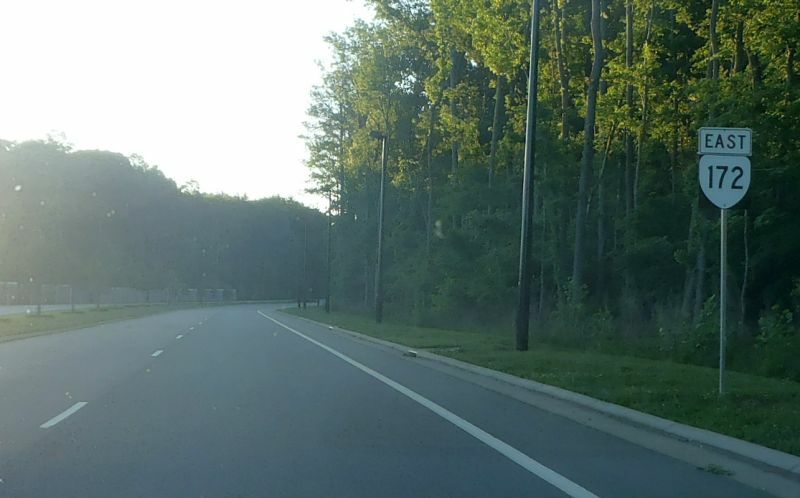 It initially ran from VA 27 (now connector to VA 134) Drummonds Corner north on Wythe Creek Rd into Poquoson, then southeast on Poquoson Rd and Poquoson Ave to end at Armory Wharf. This is the 2nd VA 172. Adjustments: In May 1946 (CTB), VA 172's east end was moved from Armory Wharf to Messick Pt, upgrading parts of SR 606 and SR 601. The road down to Armory Wharf is just unnumbered now. VA 172 moved to Messick Pt. In April 1964 (CTB), VA 172 was extended south replacing VA 134 over to NASA then back over to current VA 134 Magruder Blvd. Shepard Blvd between VA 134 and Armistead Ave was new construction. See scan in VA 167 entry. In March 1976 (CTB), VA 172 was rerouted in Poquoson to its current status running on Wythe Creek Rd to Yorktown Rd. Wythe Creek Rd from Poquoson Rd to Yorktown Rd was a replacement of part of VA 171. 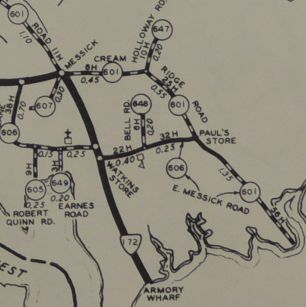 Poquoson Rd southeast to Little Florida Rd became unnumbered while the rest out to Messick Point became part of VA 171. In Jan 2014, VA 172 was extended as new construction west from VA 134 to Big Bethel Rd. VA 172 was multilaned from VA 134 to Armistead in 1964. 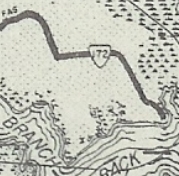 VA 172 was multilaned from south of VA 171 to nearly Poquoson Rd in 1990. 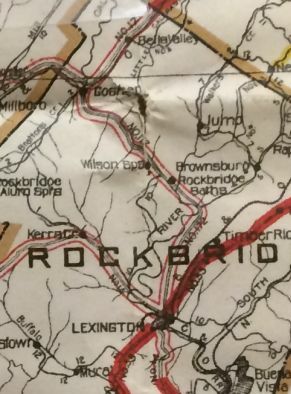 VA 172 is also multilaned from Armistead to Wythe Creek Rd, but not shown on official maps this way. All I know is that is was still 2-lane in 1993. VA 172's extension to Big Bethel Rd was multilaned. Posted: Fully Posted except at its absolute north end point. Other names: Cmdr Shepard Blvd (Big Bethel Rd to Drummonds Corner); Wythe Creek Rd (north of Drummonds Corner). Comment: VA 172 passes some interesting looking structures on the NASA Facility, as well as Hampton Speedway. VA 172 connects Hampton to the mystery city of Poquoson. VA 172 #1: Appeared in January 1923 (CTB) as new routing. It ran from VA 17 (curr VA 39-42) Goshen southeast to Cedar Grove (curr VA 252). 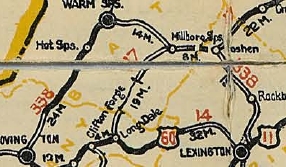 In May 1923 (CTB), VA 172 was extended south to end at VA 33 (now SR 750) East Lexington. There had been a dispute earlier about routing VA 172 to end at VA 33 (now US 11) near Timber Ridge instead. About 1926, VA 172 was renumbered as VA 338. Today it is mostly VA 39 except in Rockbridge Baths it used SR 722/602 and in Goshen it used VA 39 ALT.